For the first time in eleventy-nine races, I woke up to a morning temperature in the 40s. And it was glorious. Our corral started at 8:30, so it was kind of a chilly wait. But once we started running, I was glad I’d worn short sleeves. As we started, we heard the announcer say that the first finisher had just come in. Which is both kind of demoralizing and impressive. The first mile is a gradual incline, then it’s mostly either flat or downhill. But the Mile 2 marker is at the top of the wicked Enfield hill. Ever hear your grandparents say that they walked to school uphill both ways? Yeah, this one is uphill whether you are coming from the west like the Austin Half Marathon, or the east like Cap 10K and the Turkey Trot, and it is equally steep either way. 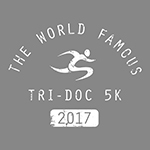 The third mile is the toughest–a steep downhill, then about half a mile uphill before kind of leveling off the rest of the way to Mopac. This was my slowest mile for good reason. Mile Four is not flat, but the hills don’t compare to the earlier ones. It used to be pretty common to see people wearing funny costumes, but today I only saw a few. 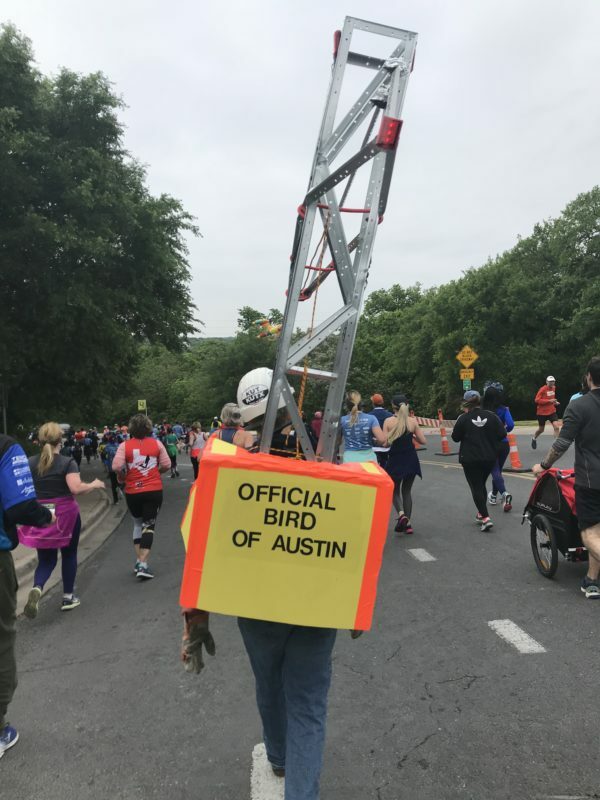 This one, a construction crane I saw right around the Mile 4 marker, nailed the state of things in Austin. 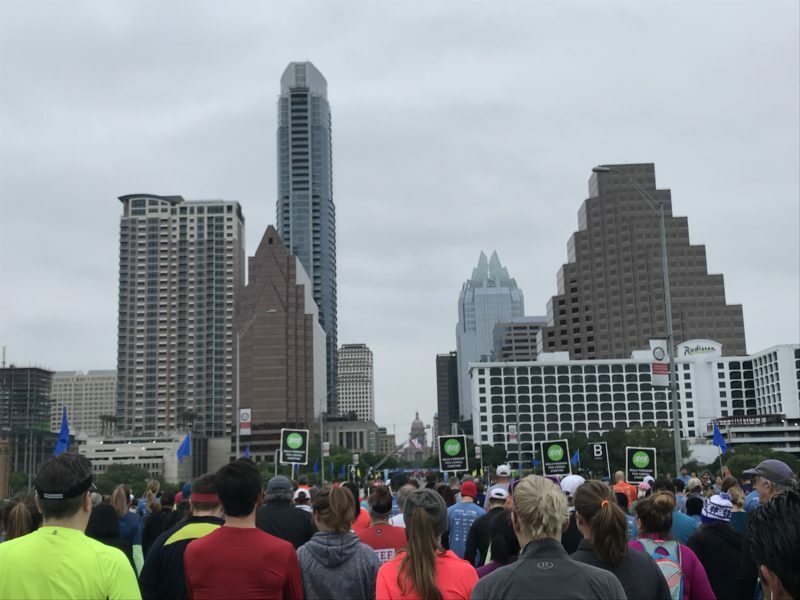 The last two miles are the flattest of the race, running behind Austin High and along the lake to the First Street bridge. By then my legs were a little tired from the hills, but I maintained a pretty consistent pace. Then as I turned onto Riverside, I picked things up for the last .2. The Teenager had to be first so he ran a little ahead, but Spouse and I finished together. I didn’t have any goals to PR the 10K distance–the hills make that super difficult–but I did want to perform well. 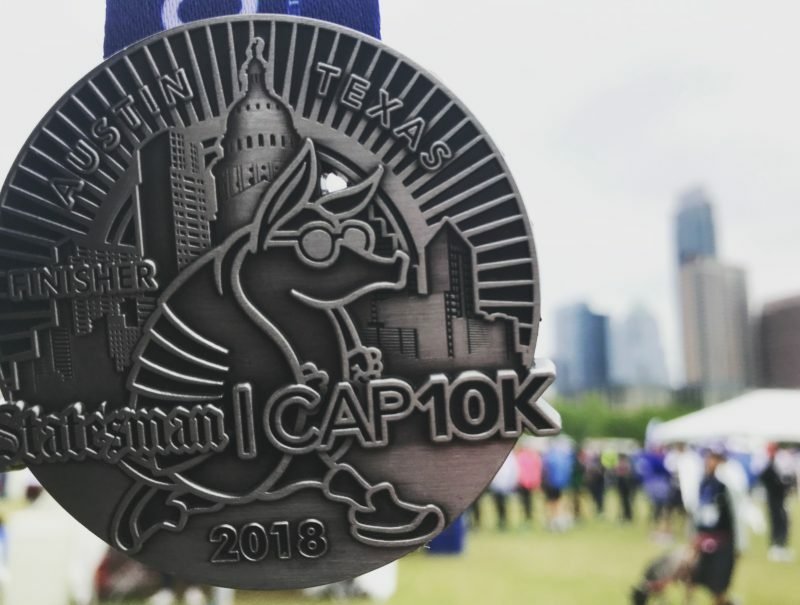 And it turns out I ran my fastest Cap 10K. I was three minutes off my 10K PR, but this is a much tougher course. The past few years I’ve struggled during this race, so I am pleased with my results today. And then there were medals. Congrats to all the finishers today–it was a great day to run!